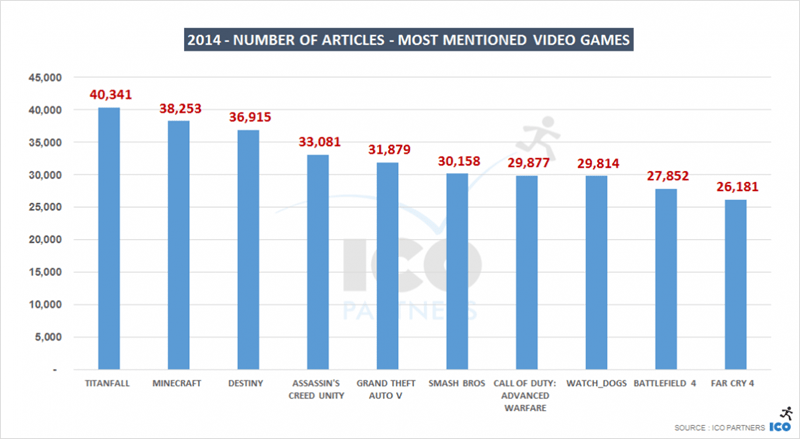 Gaming enthusiast sites and big mainstream media wrote a great many articles and stories last year – and according to research firm ICO, most of them were about the PlayStation 4 and Titanfall, with many of them wondering why one of them wasn’t on the other. 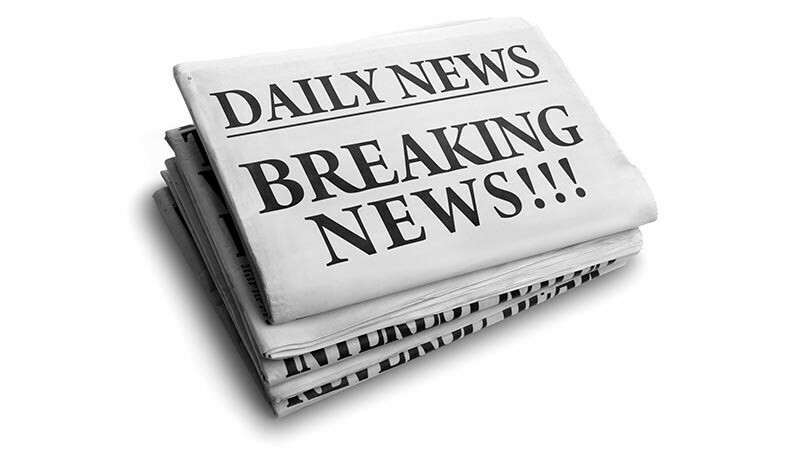 The data, compiled by ICO Partners internal tracking software, tells us that the majority of headlines written by the tracked sites were about Sony’s PlayStation brand, with a specific focus on the PlayStation 4. 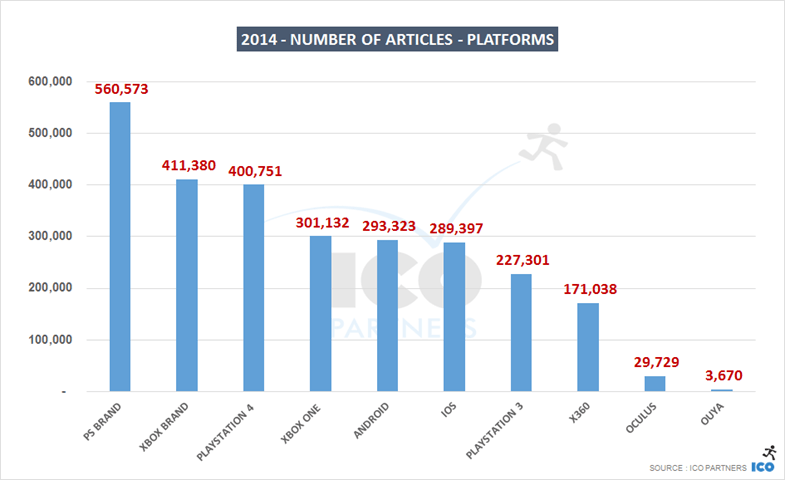 It’s worth noting that, according to ICO Partners’ Thomas Bidaux, the majority of the sites tracked are of the specialist, enthusiast variety, which accounts for the low number of headlines about mobile gaming. It makes it no surprise then that the majority of headlines were about the PlayStation and Xbox brands – skewed in favour of Sony’s platforms. PlayStation had a 35% lead over Xbox, based on 560,573 articles for PlayStation and 411,380 for Xbox. It’s interesting to see that when it comes to individual games, Titanfall comes up trumps, with Mojang’s world builder in second. “Minecraft is its own thing. I think the price tag that Microsoft paid to buy Mojang can be explained by how much of a cultural phenomenon and a cultural item Minecraft has become. While it got a lot mentions during the acquisition, it has to be noted that Minecraft is almost always in the top 15 of the most mentioned games in a month. The regularity of its media presence explains more about its presence as the 2nd most mentioned game in the media than anything else. 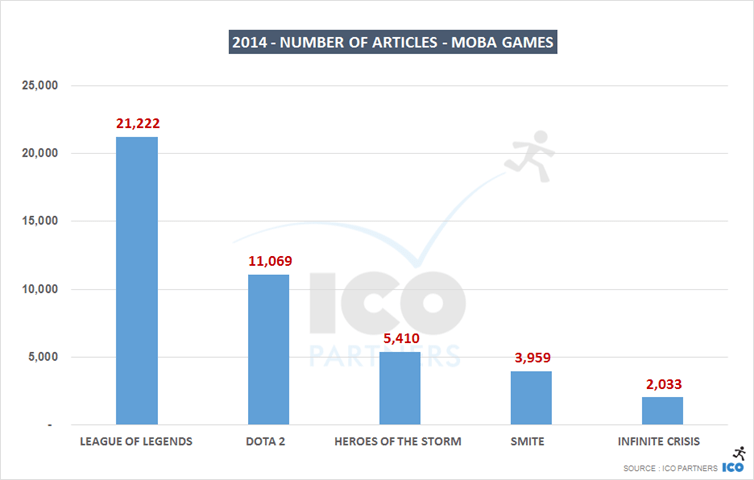 With a special focus on MOBAs, it’s clear to see that League of Legends not only dominates when it comes to players, but in headlines too. That same could not be said of us, but that’s mostly because we had a DOTA-obsessed cabbage last year. It’s an interesting look at media trends which, I suppose, highlights the fact that it’s largely a giant echo chamber.